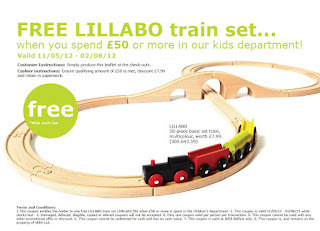 Did you hear about the wooden train? 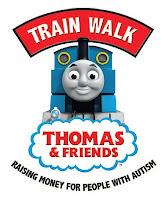 If you’re looking for something to do this Jubilee weekend, then the National Autistic Society would like to tempt you down to IKEA Belfast for Thomas the Tank Engine themed fun. From noon until 4pm on Saturday 2 June, they’ll have train rides, a bouncy castle, face painting, balloons and candy floss. 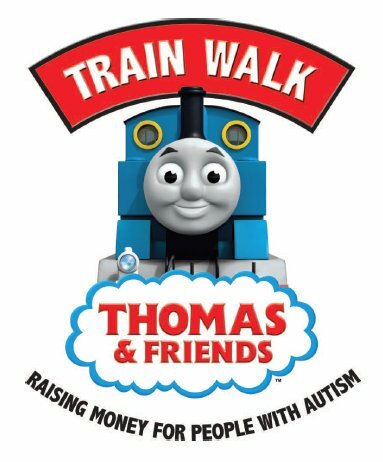 You can ‘meet’ Thomas and friends too. Even with the air conditioning installed last year, the Assembly Hall is normally (short) sleeve territory on the opening night of the General Assembly of the Presbyterian Church in Ireland. “We were aware of many congregations north and south working to be relevant in their localities seeking the welfare of those around them and we thank God for that. He noted that some congregations were “more ardently” making a difference in their societies than others. He also spoke about visits to Lebanon and Latvia. In years gone by, Moderators used to spend considerable proportions of their addresses commenting on recent atrocities and the progress of the peace process. With political commentary left to the report from the Church and Society committee later in the week, in one of the few references to civil society tonight, Patterson spoke about his interactions with “wider society”. As well as hosting a public debate in Belfast, the four main church leaders combined to lobby in Westminster about the Social Welfare Reform legislation. Patterson believes that “we have such opportunities to be salt and light and bring some flavour to a tasteless world” and become “people who are Grace filled and prophetic”. “We all have or should have, as congregations, our Mission Plans as we look to our future ministries but they ought not to be set in stone but constantly being reviewed so that we are being what God wants us to be and not to be hampered as some are through internal dissention. I believe that the Judicial Commission [the denomination’s ‘court’] has seldom been busier than this year and ongoing. Why is it we can’t rise above our own agendas and realize that we all get it wrong from time to time? While we continue to live with old grudges and disagreements we are no shop window for the transformed lives that we say the Christian faith makes. Glitz and gimmick aren’t the answer in a post-Christian world. After a bit of processing – or “the walk of the old men” as ex-Moderator Stafford Carson refers to it – the Right Rev Dr Roy Patton was installed as the new moderator. The good old days are gone. “We may well long for it to be different, sentimentalise about the days when our churches were packed to the rafters, when hundreds of children went on Sunday school outings etc, but that really doesn’t get us very far does it.? Whatever we do, we certainly cannot turn the clock back to the good old days. Patton’s suggestions were informed by the life of Isaiah and the death of King Uzziah. “Too often we give the impression that we are better than others, more moral, superior kind of people. And sadly the greatest stumbling blocks to people finding faith in Christ are the lives of those who claim to follow him. We resent being called hypocrites and of course people may make such a charge in order to hide behind it, but the nevertheless we need acknowledge how we have failed to be true followers of Jesus. And we need to name those areas of life in which we have failed. Like Isaiah who acknowledged that he was a man of unclean lips, we need to acknowledge those ‘Christian’ sins- sins of bitterness, gossip, exaggeration, destructive criticism.- which sadly are too often prevalent in our lives and too often found in the church. The agenda (and reports) for the week of General Assembly – which is nearly all open to the public – is available on the Presbyterian Church in Ireland website, and you can follow some of the business at @pciassembly or at the #pciga12 hashtag. Lights, camera, action! Belfast Film Festival is back, running between 31 May and 10 June with one hundred films and events crammed into their programme. 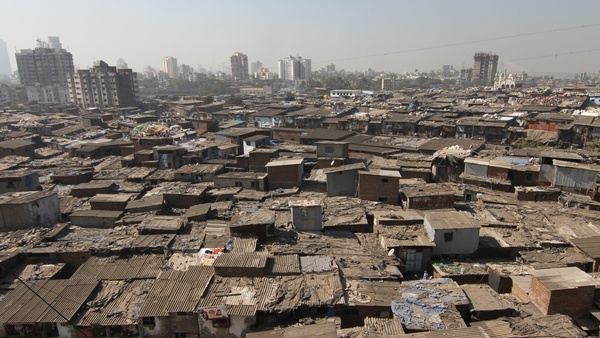 Urbanized – A feature-length documentary about the design of cities. Who shapes out cities and how do they do it? Exploring a diverse range of urban design projects around the world with comment from architects, planners, policymakers, builders and thinkers. Directed by Gary Hustwit. Supported by PLACE. Test Pilota Pyrxa – “A gripping space adventure with a strong social undercurrent.” A Polish film in a crew made up of both humans and robots (“non-linears”) launch two satellites in a bid to prove whether humans or robots are safest and most cost-effective. Disaster strikes. Directed by Marek Piestrak. The Crying Game – Part of the festival’s spotlight on Stephen Rea. 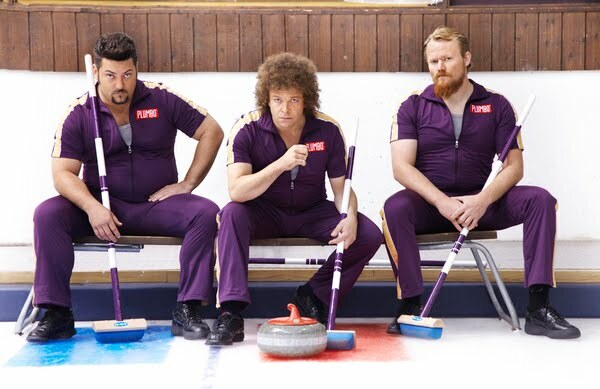 King Curling – An OCD curling champion banned from the sport reforms his curling team to win the national championship and use its prize money to fund an operation needed by his old coach. A Norwegian knockabout with visual humour, middle aged men and deadpan humour. Directed by Ole Endresen. Alive from the Divas Flats – A free documentary screening of the true story of Hugo Straney, an Irish Canadian from Belfast who now lives and performs in Toronto. With two record deals, weekly gigs and a radio show, it’s the honest story of an ‘everyman’ and his journey from “a disaster in social housing” to Toronto and beyond. Directed by Eleanor McGrath. Shadow Dancer – Collette is a victim of the Troubles. Now caught up in the Republican movement and arrested she faces life in jail. Or she could return home as an MI5 spy. A psychological thriller. Directed by James Marsh. Polisse – The daily routine for the Paris Police Department’s Juvenile Protection Unit is interrupted by the arrival of a photographer assigned to document the squad. Fighting to defend the defenceless, the film shows the growing effect of cases on the officers and the cost to their private lives. 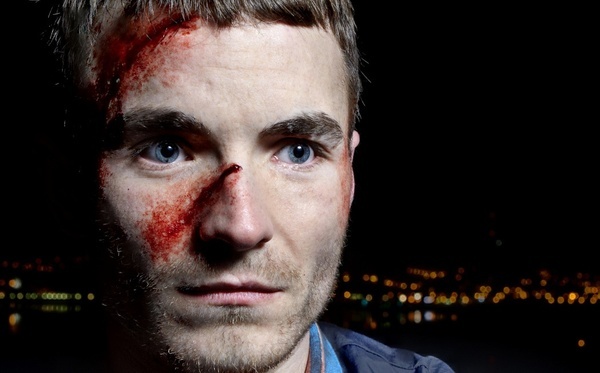 Crime drama with a touch of humour and humanity. Directed by Maiwenn. 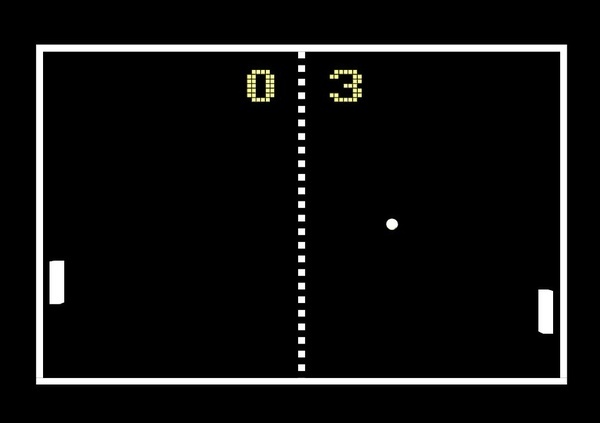 11th Belfast World Pong Championships – The annual lo-res graphics alternative to Wimbledon takes place in the John Hewitt Bar. Commentators will guide you through the suspense, drama and clever technique of this machine-assisted tournament that surely should have included in the London 2012 Olympics. 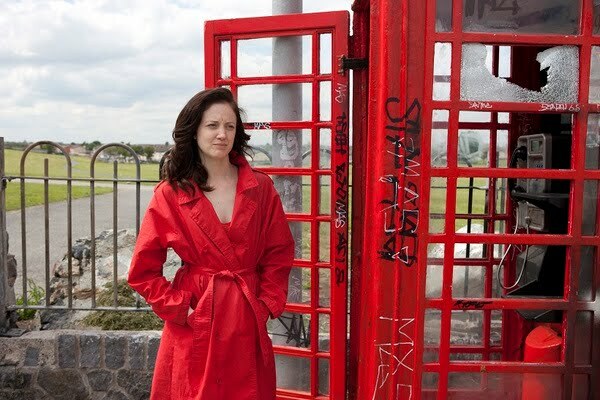 Toothbrush – Set in Belfast during a four week freeze in which it was cheaper to flush the toilet with lemonade than buy bottled water”, Bronagh is desperate to find a man before she’s thirty and adopts a friend’s persona as a mask to get counselling on the matter. But the doctor isn’t in and hew secretary is pretending to be the doctor. Directed by Michael McNulty. The Social Life of Small Urban Spaces – An outdoor screening in Commercial Court car park, supported by PLACE. The film exploring the open spaces in cities, using time-lapse observation of how people interact with each other and the with public areas. Film written by urbanist and journalist William H Whyte. 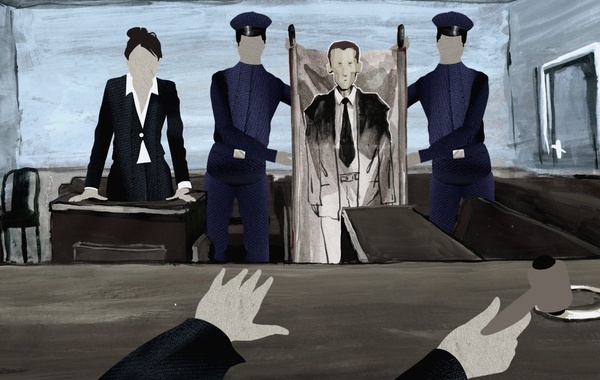 Crulic – A Romanian/Polish animated documentary “recounting the Kafkeesque history of a Romanian man arrested in Poland and abandoned by everyone until his death following a hunger strike in 2008. 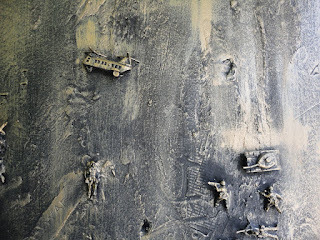 Hand drawn images, collage, and cut out animation illustrating the miscarriage of justice. Directed by Anca Damian. The Bookseller of Belfast – A bookseller who is now without a bookshop after his shop in Smithfield went up in flames. 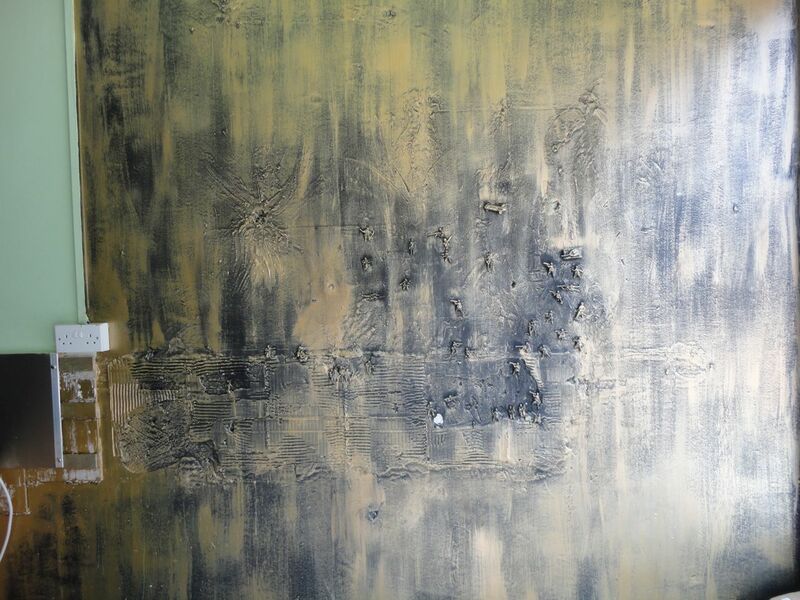 The staircases of John Clancy’s terraced are filled with hundreds of unsold volumes. His attic is filled with thank you letters from around the world. Distributing books is a vocation not a job. Directed by Alessandra Celesia McIlduff. Jump – Four twenty-something’s lives collide on New Year’s Eve, their lives linked by the unseen disappearance of a man at the hands of a local crime boss. Depression, fears, hopes and love. Directed by Kieron J Walsh. Also worth noting a series of talks and screenings about Film and the Law taking place in High Court Number One in Belfast’s Royal Courts of Justice. BBC NI are once again screening classic television programmes for free during the festival. However, the details aren’t included in the BFF brochure and aren’t yet listed on the BBC tickets website. When Belfast City Council’s Investment Programme was launched earlier this year, it included a reference to expending the conference/exhibition space at the Belfast Waterfront. Along with colleagues, I idly wondered where the additional space would be found. Would they build a glass covered bridge across to the unfinished building sitting in front of the Waterfront? 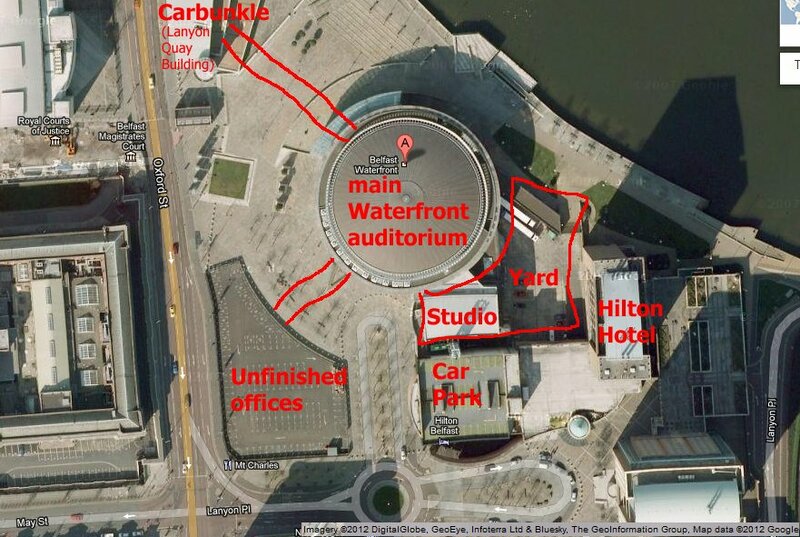 Could the ugly carbuncle (Lanyon Quay Building) between the Waterfront and the new Laganside Courts building be used? It turns out that the option being recommended to the council’s Strategic Policy and Resources Committee is to knock down the Waterfront Studio and build the conferencing centre in its footprint and over the yard in behind. The Waterfront Hall – now known as the Belfast Waterfront – was built at a total cost of £37 million and opened in 1997. The Arts Theatre had long been closed, and the Waterfront Studio theatre provided a council-owned space that drama groups could use at reasonable rates, as well as providing a small city-centre theatre venue for newly launched plays. These were the days before the Baby Grand, the rebuilt Lyric and the Belfast MAC. 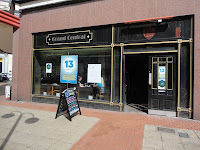 The Group Theatre on Bedford Street (attached to the Ulster Hall) didn’t survive the Grand Dame’s renovations, and although community theatre groups were at the time reassured that the access policy for the Waterfront Studio would fill that space, the days of Belfast Council running a theatre space suitable for community groups may be numbered. A total of 63 opportunities have been lost in the City [Belfast] and by the Waterfront directly over the period 2008-2011 with the key reason given the lack of appropriate integrated conferencing facilities. While a 2011 business case recommended linking the Waterfront with the empty level 0 and 1 floors in the Lanyon Quay Building, a more fulsome Economic Appraisal evaluated a long list of ten options came back with a more ambitious plan. Two Story [sic] Extension of the Waterfront over the Service Yard to the rear of the Venue, with further extension over River. It involves demolishing the existing Studio area, and has the potential to create units to let (or storage space) on the ground floor level in front of the existing Studio. banqueting space that can accommodate up to 750 people. This requires a capital investment of £20 million (a suspiciously round number). It would also benefit from speedy decisions as the Council and Northern Ireland Tourist Board reckon they could tap into £12 million or so of money from the European Regional Development Fund (ERDF). But the ERDF closes at the end of 2015, and all funding would need to be drawn down by that date (ie, the building work would need to be completed). Accessing the ERDF also throws up an issue of staffing. The assessment concluded that the there was an enormous benefit to having an operator that was “established in the market place with a reputation for delivery” over continuing as a Council-managed facility. Whereas a council-run extended convention facility could see a projected economic benefit of £21m per annum, outsourcing to an external operator would see the projected economic benefit nearly double to £39m per annum. If a professional operator could hope to achieve this level of extra (or better) business, would these figures not suggest that the council – up to now – hasn’t developed a reputation for being good at managing its conferencing venue. The aim would be to see a six fold increase in the number of National Large Association conferences held in Belfast (from one a year in 2010 to six a year in 2020) and a twelve-fold jump in the number of International/European Association conference held (from one every two years now to six per annum by 2020). There’s a gotcha in the report to the Strategic Policy and Resources Committee. The report’s figures do not take into account (or even estimate the size) of “any compensatory payment which may be required by the Hilton [Hotel] as part of the extension agreement” nor “any additional costs which may be incurred through the transfer [TUPE] of relevant staff to an external operator”. The report reckons that extending the conference facilities and running it in-house would net cost the council £215k each year. Whereas outsourcing the operation to an existing supplier would offer a net saving of £911k, equivalent to “a 0.72% reduction in the district rate (2012/13)”. There’s a second gotcha in the report. If the new facility is to achieve the projected income set out in the Economic Appraisal the business model for the Waterfront will have to fundamentally change from that of an entertainment venue to that of a conference centre. Guess which bit of the Waterfront’s business has been increasing over the last few years? Entertainments. Despite the neighbouring Odyssey area, the Waterfront’s main auditorium and smaller Studio have been busy. And guess which part of the Waterfront’s business has nose-dived over recent years? Conferencing. 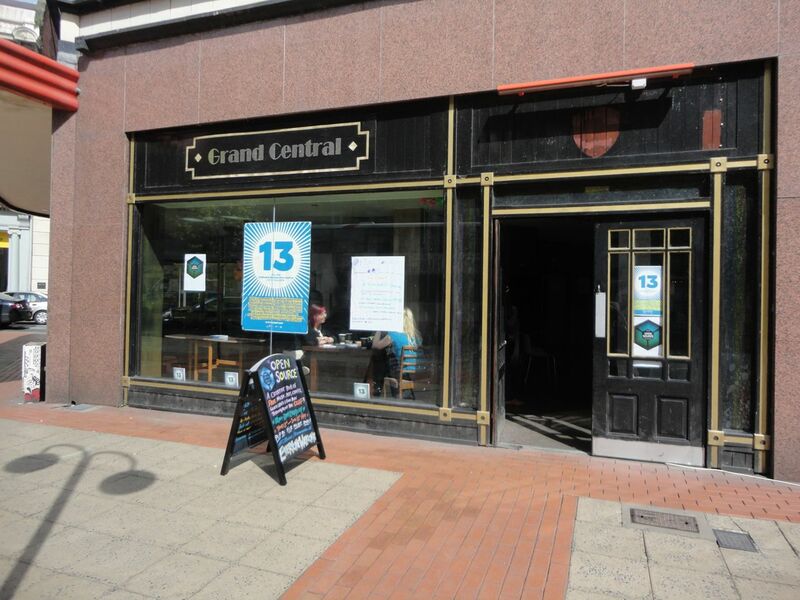 With the removal of the Waterfront Studio – the last of the council’s theatre spaces – it is unlikely that community theatre could afford the prices charged to hire the small venues in the Lyric Theatre or Belfast MAC. Both venues received public funding, but are run on a commercial basis. Instead, community-based groups would have to look to Newtownabbey or Lisburn council theatres, well outside their catchment areas. The question for Belfast City Council is whether they want to demolish part of a building they may still be paying off the mortgage on to remove the community-accessible Waterfront Studio and replace it with a convention centre that may or may not attract more briefcases business to Belfast? Eagerly anticipated by science fiction fans, the QFT was packed out and a queue formed while waiting for the previous film to finish. The geek count was high with flyers for fan groups and other scifi screenings being distributed to the waiting crowds. A US moon landing – orchestrated to boost the incumbent Sarah Palin’s US president’s chances of re-election – stumbles on an impressive moon base on the dark side of the moon. Built by Nazis fleeing Germany at the end of the Second World War, and undiscovered until now, plans are underway within this lunar community to invade Earth and finish the job the Führer started. The capture of a black American astronaut causes consternation in the Nazi base. Is a moon invasion by Earth imminent? Little do they realise that the captured spaceman James Washington (Christopher Kirby) was chosen to front the populist ‘Black to the Moon’ mission for his pretty looks rather than his military or scientific expertise. 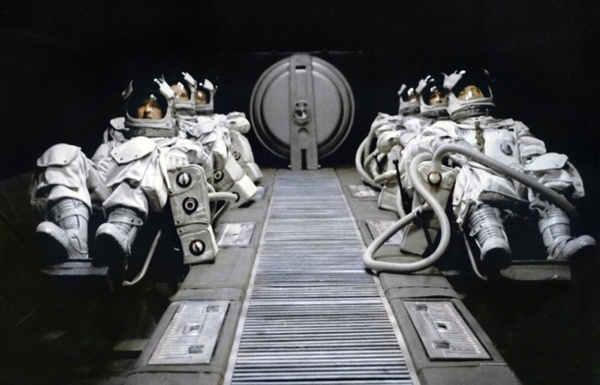 The plot follows the ambitious Klaus Adler (Götz Otto) as he heads back to Earth with his stowaway fiancé Renate Richter (Julia Dietze) to gather a much-needed power source with which to fuel the enormous Götterdämmerung invasion craft. Can they slip into twenty first century society unnoticed? Will heavy threat or lyrical idealism be most convincing? As a film Iron Sky didn’t disappoint. The audience laughed and giggled their way through the plot as the relationships between the Nazis, the US president and her staff became ever more confused. There are a lot of hidden references to other films, books and modern culture. While the science in the film is often flimsy, the plot, costumes, CGI and sets are full of great details: Trench coats, Charlie Chaplin’s The Great Dictator, imaginary German compound nouns like Meteorblitzkrieg, strong women and flawed humanity aplenty. After providing so many unfortunate or unexpected laughs over the preceding ninety minutes, the film’s serene ending is an amazing act of directorial bravery and left the QFT audience in stunned silence as the final scenes were projected onto the screen. Iron Sky will not play well to many US audiences. Dogfights over cities and burning buildings will ring 9/11 alarm bells. Politically the film is at times more anti-American than anti-Nazi. And the film’s 15 certificate is deserved given the language used at various points. Well worth going to see this weekend (or ordering on DVD /Blu-ray) if you want to escape to the dark side of the moon and enter a science fiction world that would make your physics and history teachers flinch. Update - Norwin's thoughtful review is now posted on Destroy All Onions. 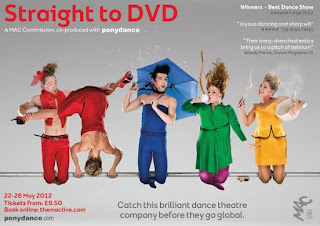 Straight to DVD is running at the MAC this week (Tuesday 22 to Saturday 26) with tickets available from £12 (£10 concession). It’s being performed Upstairs at the MAC (that’s how the MAC refers to its 120-seat theatre, as opposed to the 350-seater Downstairs at the MAC). The show is produced by up-and-coming ponydance and commissioned by the MAC as part of its opening season. Expect comedy sketches, ad breaks and lots of dancing to explore “the highs and lows of reality TV and pop culture” including “synchronised swimming in a paddling pool and a gymnastics floor routine which may require a helping hand from audiences”. Some more background information over on Culture Northern Ireland. A black taxi tour of Belfast? Surely that’s just for tourists? There are huge areas of Belfast that I’ve never visited. Election observing has taught me a few routes through West Belfast to wind around a handful of polling stations on the way back to Lisburn. Even while living in East Belfast, there was often little reason to go further down the Newtownards Road than the Connswater junction with the Albertbridge Road. So I was glad of the excuse to see a bit more of the city last week on a “political tour” with Jim from NI Black Taxi Tours. You can get a flavour of the tour in the embedded timelapse video shot out the window of the cab. For £25 you get ninety minutes or more visiting some of the more vivid murals and memorials in the west of the city. You’ll stop off at murals in the Shankill commemorating loyalist antagonists like hitman Stevie ‘Topgun’ McKeag, the memorial wall marking atrocities on the Shankill, and then drive along the “Peace Wall” full of scribbles from peace-longing visitors including Bill Clinton. Then it’s across through the automatic barriers at Lanark Way to see the other side of the interface. Described as an area where it’s “100 per cent Catholic” the taxi stops at the memorial garden in Bombay Street. Nearby homes backing on to the wall have wire mesh grills to protect the back of the houses. The well-kept memorial commemorates IRA volunteers as well as civilians killed in the Clonard area. There’s a stop off at Bobby Sands’ mural on the side of Sinn Fein offices and the republican gift shop to hear about the hunger strike, and then down to the nearby International Wall that pictorially relates to “other civil wars” across the world. It’s obvious that across Belfast the murals are constantly being touched up and updated. Fascinating to see how every panel on the wall has been adapted to call for Marian Price’s freedom. The final stop on the political tour is the Crown Bar … unless you want set down somewhere else. Whereas a bus tour glides past landmarks – and probably covers a much greater distance – the taxi tour gives you a chance to get out of the cab, stretch your legs walking around sites with the driver and the opportunity to ask questions. Don’t expect to be immediately immersed in a deep and nuanced history of the Troubles. It’s a simplified narrative, though the driver will be happy to open up about a surprising range of topics if you choose to probe. But it’s a good start and a whole lot better than a static museum display. Our Belfast Black Taxi tours and Belfast Black Taxi Political tours start at just £25 for two people. Each additional passenger costs only £10. The average duration of each tour is around 1 hour 30 minutes, but can be tailored to suit. We can also cater for large groups. 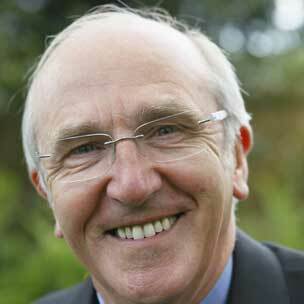 Chris Jenkins raised questions about the morality of troubles tourism in a recent Guardian Unlimited article. Matthew Symington followed up with an extended interview on Eamonnmallie.com in which Chris again challenged the trend of “money being made from human tragedy” and the DUP’s switch from opposing a “shrine” at the Long Kesh to supporting a “Mecca for tourists” at the Maze site. Last week’s taxi tour didn’t feel voyeuristic. As an outsider to those areas who learned about many of the atrocities and events through Good Morning Ulster while eating breakfast before school rather than living through them, it was a very visual reminder of our conflict and its legacy. And at certain points it was quietly moving to stand and reflect on lives lost and lives wasted. Few local people take a taxi tour. Some accompany guests who are visiting Ireland and staying with them. Some folk come up from Dublin. But mostly, its tourists, usually Americans. In terms of being better able to place events in a broad context, I’d recommend it as a first step in the process of engaging with history. 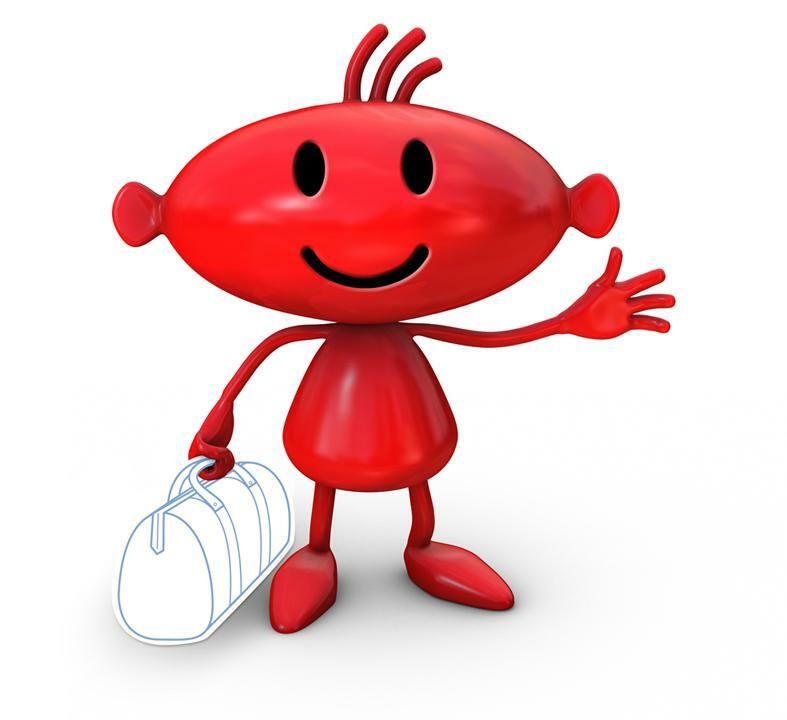 Disclaimer – I was contacted by NI Black Taxi Tours and offered the tour. The cab was yellow, not black! Iron Sky - Nazis from the dark side of the moon - one night only at the QFT! If I told you that the QFT was screening a film this time next week about Nazis in space, you’d perhaps question whether seeing Morons from Outer Space as a child had affected my ability to distinguish good science fiction from flawed sci fi! And if I added that the Finnish-German-Australian film took six years to produce and is only being released for a single day in UK cinemas – next Wednesday – you might also tilt your head to one side, raise an eyebrow and slow shake your head. But for your delight and delectation, the Queens Film Theatre are screening Iron Sky at 9pm on Wednesday 23 May. It’s certain to become a comedy sci fi cult classic. And it’s probably* not quite as terrible as it sounds. The script is absolutely cheesy, the visual effects are astonishing, and the action is non-stop. There isn't much to say about the film besides the fact that it's a strange yet entertaining time at the movies and you're sure to not forget it because, even though some people will hate it and others will like it, the story is just so random you can't not remember it. Definitely one to check out for yourself, but just a heads-up for everyone; there's NOTHING realistic about the film. That's another reason why it's really fun. Tickets still available from the QFT. See it on the big screen before it comes out on DVD and Blu-ray on 28 May! * I’ll confirm the veracity of how terrible it is after I see it next week! I mentioned one of Malachi O’Doherty’s in conversation events on the blog last month. 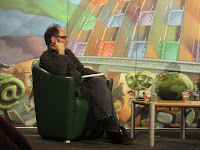 In his role as the BBC Louis MacNeice Writer in Residence at Queen’s University Belfast he had been interviewing Tom Rachman, author of The Imperfectionists. 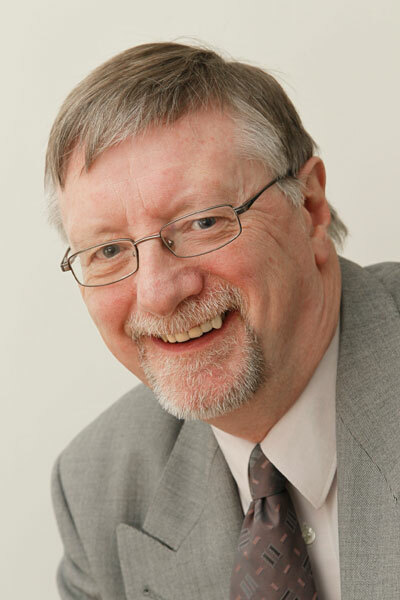 Malachi is very well known in Northern Ireland as a journalist, author and commentator on social, cultural, religious and political goings-on. As the chairs in the BBC studio were being stacked, I asked Malachi about what had attracted him to apply for this BBC funded post at the university. The answer: stability, continuity, as well as esteem. He has a remit to bring discussion of journalism into the university and the community, as well as contributing to the work of the English Department. The events have run alongside the emerging phone-hacking story and the subsequent Leveson inquiry that has raised the profile of issues around media ethics. In the past 18 months or so he has run traditional book groups, formed a blog group and held public sessions at which he has interviewed local, national and international journalists and authors. 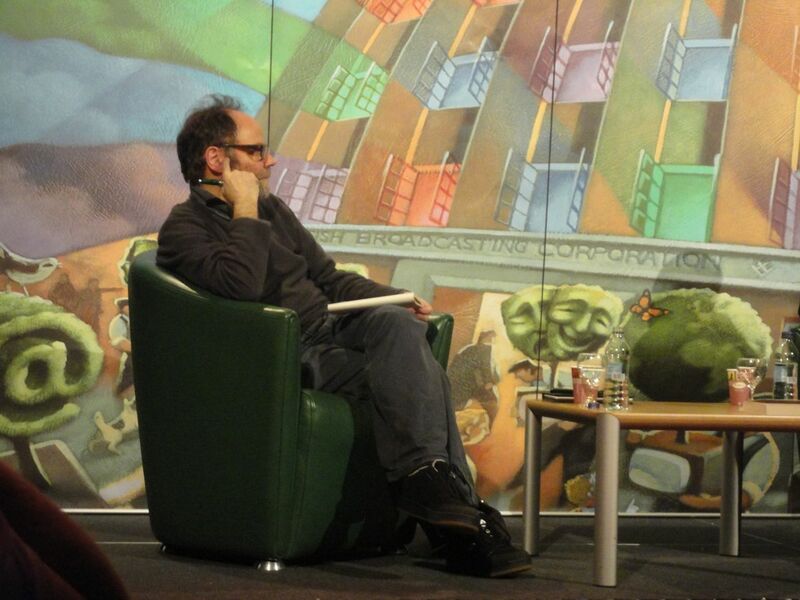 Audio clips from many of the interviews are available on his blog: The Writer’s Log. http://writerslog.net/ Keep an eye on his Coming Events page for future interviews. Aside from investigating journalism, Malachi is still writing. His latest book is due to be published by Blackstaff Press later this month: On My Own Two Wheels. And while he wasn’t sure his editor would let him away with the subtitle, looking at Amazon it seems that Back In The Saddle At 60 has stuck! Appropriately, the book’s being launched at Bikedock, 79-85 Ravenhill Road, Belfast at 6pm on Thursday 24 May. Chris Taylor and Matt Johnston have been hosting a weekly technology podcast over on EamonnMallie.com since January. Last week, Chris spoke to Nichola Bates, one of the founders of CoderDojo Newry, a computer programming workshop aimed at children from as young as eight years old. Dojo is a Japanese term that has been used to describe martial arts training centre. Practitioners from the local IT industry sign up as mentors and coach the children as they work through each session’s activities, stretching their understanding. At Coder Dojo Newry our aim is to encourage kids to get into computing and to be really good at it! There are lots of jobs and start up opportunities for good programmers – and as far as we can see there always will be. No prior programming experience is required – if you are honestly interested in computing come a long and try it out! Like all Dojo’s we try to make it relaxed, fun, cool and interesting. No lectures or classroom approaches here – it’s 100% hands-on coding with the help of volunteer mentors to pass on their knowledge and keep you challenged! As well as the well-established CoderDojo Newry and one that began today in Belfast MET, there are also large number of other Dojos already running across the island of Ireland. Compared with UK-based 24 hour news, it has none of the stuffiness and oozes quirkiness and endearing informality. It’s regular Tech 24 and Webnews slots are perhaps closer to BBC World Service Click (the radio show formerly known as Digital Planet and presented by Gareth Mitchell and Bill Thompson) than the TV equivalent. You can replay some of the coverage and swivel around, up and down and zoom in and out. On the night of the election results, France 24 offered an iPhone/iPad app that allowed viewers to use their fingers to scroll around rather than the stabbing with a mouse on their PC. Try the second clip under VOD2 on the Direct 360 webpage for a good example. It’s a fascinating insight into a live production. While one person talks, those opposite are shuffling their scripts, whispering in each other’s ears and texting. During speeches from the candidates and segments from reports outside the studio, there’s much hand waving to the gallery, conducting as the crowds rhythmically cheer for their candidate, and members of the crew race around to refill glasses and bottles of water. 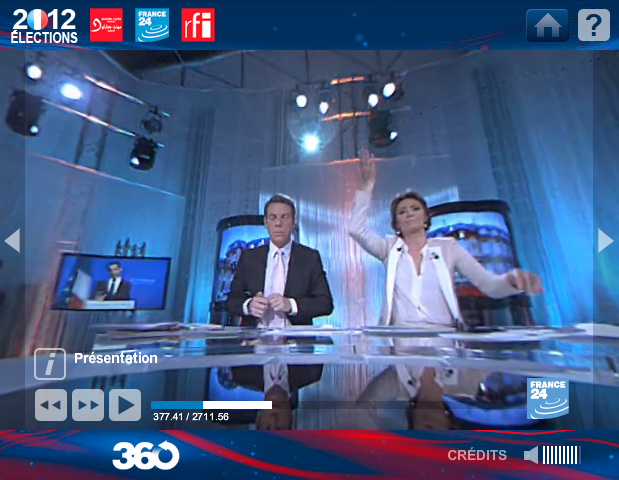 The always-on nature of France 24’s panoramic view means that the slick production values of the director and vision mixer up in the gallery are completely eliminated. Instead the visual cues, the normally unseen negotiation between presenters and guests are exposed, not to mention the lighting rig which for this temporary studio was not mounted overhead. The innovation is discussed briefly on the English language Tech 24 show where presenter Eric Olander describes it as “the next step in interactive television”. Other than the benefit of improving media literacy and allowing more people to understand what goes on behind the scenes, I’m not sure that the 360 degree actually improved the coverage of the election results. But given the relatively low cost of setting it up, I’m sure a local broadcaster will try it at some stage! Are public libraries under-appreciated and under-used? From the 1880s, Andrew Carnegie began to give money to build libraries – the most widely recognised feature of his philanthropy. From that date, he devoted himself to providing the capital for the building of public libraries and the development of library services. Between 1883 and 1929, 2,509 libraries were built, including 1,689 in the USA, 660 in the UK and Ireland, 125 in Canada, and others in Australia, New Zealand, the Caribbean and South Africa. So it should come as no surprise that the Carnegie UK Trust has published a report looking at the state of public library services in the UK and Republic of Ireland. 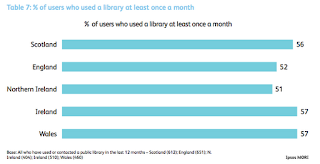 It highlights the divergent library policies across regions of the British Isles, as well as major differences in the levels of usage. In terms of public expenditure on libraries per person, NI is ahead of England and Wales, though lagging behind Scotland. 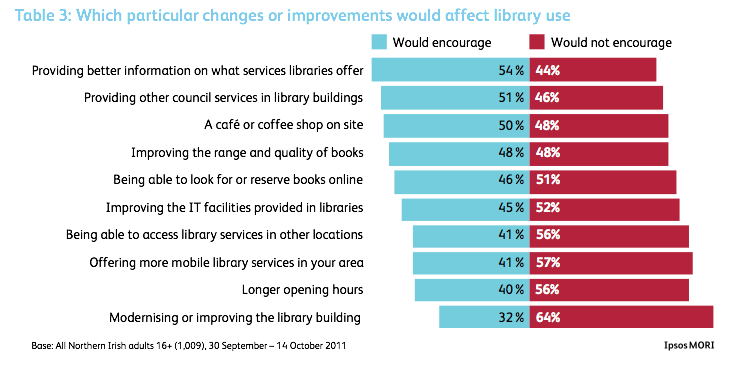 However, in these austere times, funding of library services have already and will continue to be cut. Local libraries aren’t just about dead trees bound into books. They are places where knowledge is valued and the tools for researching and finding information are taught. Life long learning from just after cradle to just before grave. Local libraries are an important focus for literacy and digital literacy, and often the public internet locations of last resort for households without broadband. The banks of PCs and IT literate library staff also help communities grapple with local and central government services that are increasingly being pushed online. In Northern Ireland, Carnegie's research found that 30% of adults never or rarely read books, while 44% deem themselves to be prolific readers. 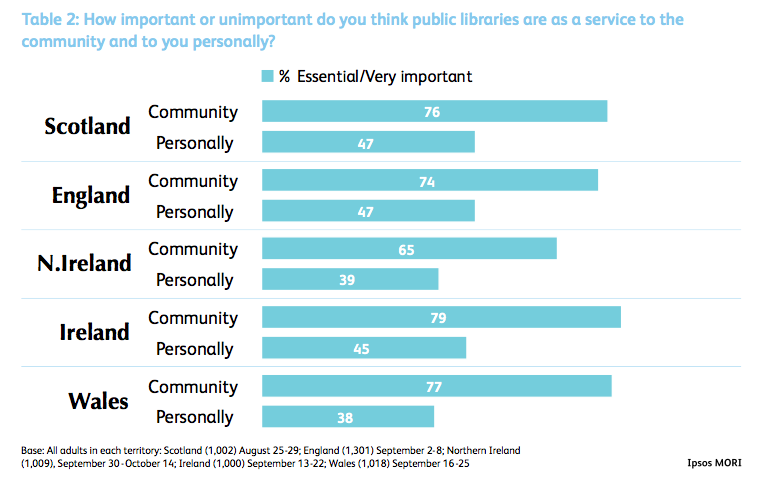 In a sample of 1,000 adults in each of the five jurisdictions were asked about the importance of public libraries as a service to the community, Northern Ireland scored lowest, and the Republic of Ireland the highest. 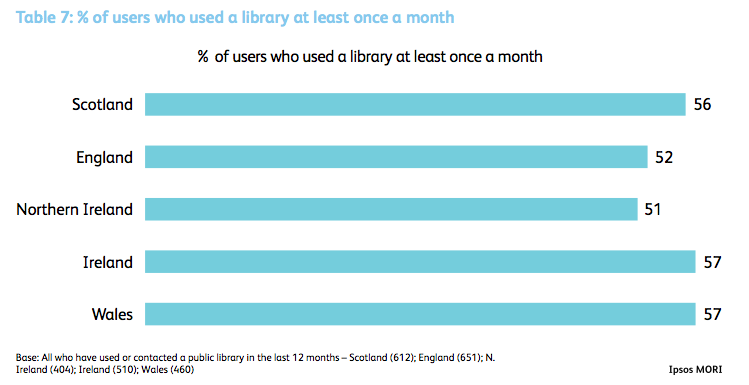 Library usage in Northern Ireland lags behind Scotland, Republic of Ireland, England and Wales. And of those people who had used a library in the last year, the survey showed that NI had the fewest people who used a library at least once a month. 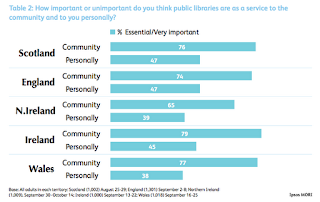 Presented with ten different factors that might encourage use of library services, providing better information on services was the top improvement desired by those surveyed in Northern Ireland. There was stronger support for offering more mobile services in NI than any other jurisdiction. Having a coffee shop on site and doubling up with other council services in the library building were also popular in NI. Interestingly, while longer opening hours would encourage greater use by existing library user (60% in NI, 55% across UK+ROI), it made little difference to non-users (26% in NI, 28% across UK+ROI). Over Easter, every available space - including the floor - seemed to be occupied by groups of teenagers revising for GCSE, AS and A-level exams. By lunchtime, the newspapers beside the soft seats were well thumbed and battered. Youngsters were storming around the children's section. The upstairs cafe always seems to have a steady trade - no one seems to mind the risk of sticky fingers on the newly borrowed books! - and all that activity is before you take in the Lift the Lid open piano sessions every third Saturday. Yet the library could be a lot busier, and reaching out to a great proportion of the local community. The Carnegie UK Trust report finishes with eight conclusions. There is a continuing and important link between the services provided by public libraries and individual wellbeing. There is at least a potential link between libraries and community wellbeing. The enduring link between public libraries and individual and community wellbeing means that the public library should continue to be a core public service, provided on a universal basis to all citizens. This core needs to be redefined for the 21st century, but all citizens in the UK and Ireland are entitled to a core library service to be provided free of charge. Encouraging reading through the provision of books and other information should remain a core part of the library service. There is a need for national policy and leadership in the area of library provision in each jurisdiction. Local authorities need to consider how to communicate more effectively and more creatively about the services they provide, particularly to those who do not currently use the service, but might benefit most from it. Library buildings, and their place in their communities, must be considered separately from the public library service itself. 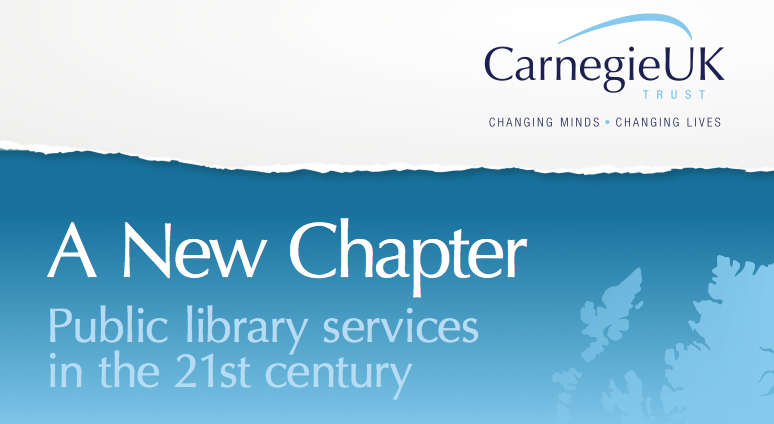 During 2012, the Carnegie UK Trust “aims to support and facilitate joint learning across the five jurisdictions to develop better shared understanding of the threats to the public library service, the opportunities which exist, and the kind of solutions which will contribute to the long term sustainability of the public library service”. Hopefully, Libraries NI, the CAL committee and DCAL will read the research (which includes a paper highlighting the specific findings for NI) and engage in this initiative along with other providers of public services. Radio 4's thirteen minute Profile programme this week turned its attention to Roy Hodgson, the new England football manager. As a non-sports fan who normally skips this kind of podcast episode, it was interesting to discover the background to the man who will either be lauded or vilified by the time this summer's Euro football tournament finishes. Speaking five languages - at least well enough to communicate with European players in their native tongue - and described as "a broadsheet man in a tabloid world", Roy Hodgson has a history of picking up weak teams and "turning water into wine", with the notable exception of his brief six month spell at Liverpool. Well worth a listen (starts 30 seconds in). Some other recent episodes to highlight: Jeremy Hunt, Kim Jong-un, Jimmy Wales (founder of wikipedia) and - what felt like an April Fool spoof but wasn't - Dame Edna Everage. So many songs come to mind with the news that BMI Baby is to close its base and cease flying in and out of Belfast from 11 June, and to ground its fleet completely after 10 September (unless a buyer can be found). Launched in early 2002, 420,000 passengers went through George Best Belfast City Airport last year on bmibaby. They never did fix their online check in process that would allocate very young children in a different row to their parents. But Tiny - bmibaby's baby logo - will be backing his bags for the last time soon. Adam Turkington and Venus speaking about Open Source Belfast, now open in Sinclair House as part of SomewhereTo_. I was along on Thursday afternoon to run a session on Audioboo which the team may use to help capture and promote the varied programme. While I was there I filmed a timelapse with a camera stuck on top of an egg timer. You can listen to the audio underneath the timelapse in the clip below. 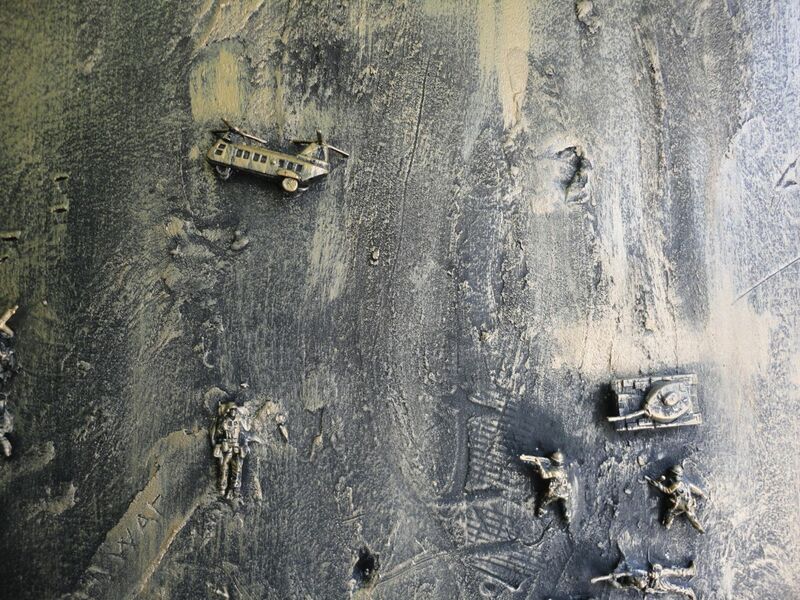 One wall in the venue - which used to be a cafe - looks very rough, until you look more closely and find a miniature military landscape embedded in the plaster. Quite bizarre - and well worth popping into Sinclair House for a look. Did I mention they serve tea and coffee? 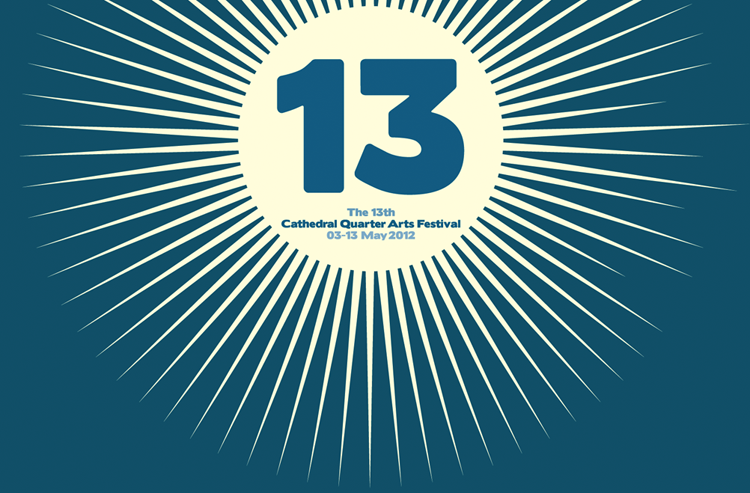 Cathedral Quarter Arts Festival is back, running this year from Thursday 3 to Sunday 13 May. 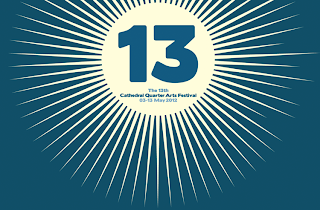 This year must be flying in: it doesn’t feel like three months since the baby sister Out To Lunch festival finished in January. Pope Benedict: Bond Villain by Abie Philbin Bowman // Saturday 5 May at 8pm // The Assembly Rooms // £7 // I’m a big fan of Abie Philbin Bowman’s comedy, having caught his Guantanamo show in London a few years ago. Behind his themes and jokes are hard-hitting challenges to public perceptions and norms about important issues. 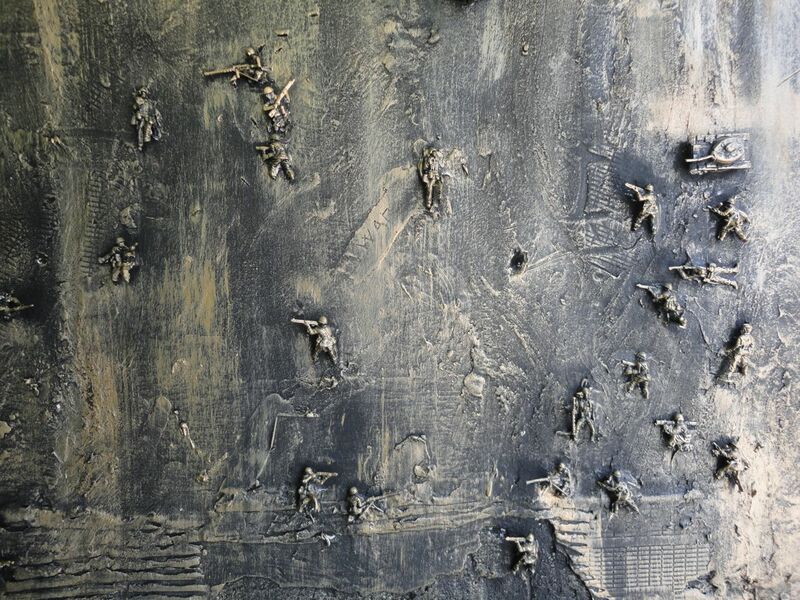 Homebird // Sunday 6 May, 5pm and 8pm // The Dark Horse // £6 // The 1948 story of Maire de Baroid’s family emigration to California leaving her behind in Cork, told through the “evocative sounds of voice, guitar, Irish harp and fiddle”. An aural treat. Oscar Niemeyer: A Vida é um sopro (Life is a brief moment) // Tuesday 8 May at 6pm // The Dark Horse // £4 // A film about the great architect Oscar Niemeyer whose “buildings tend towards the formal and monumental, sometimes at odds with his socialist principles”. Followed by a panel discussion. You can’t beat a good architectural film! Simon Hoggart // Tuesday 8 May at 8pm // The Black Box // £8 // Reading from “his compendium of anecdotes from his life in journalism”, parliamentary sketch writer Simon Hoggart will let you into the secret of what he’s witnessed over the years. Glenn Patterson: The Mill for Grinding Old People Young // Tuesday 8 May at 8pm // The Assembly Rooms // £8 // The local author will read from his new novel telling the story of Gilbert Rice (born 1812), working beneath the shadow of Harland & Wolff and dealing with the impact of his love affair with Maria, a Polish barmaid. Michael Smiley – Immigrant! // Thursday 10 May at 8pm // The Assembly Rooms // £8 // Michael Smiley tells his comic story of leaving Belfast for London and moving from a “homeless, jobless, futureless young man” to life as a actor and comedian. Mark Thomas – Extreme Rambling // Thursday 10 May at 8pm // The Black Box // £8 SOLD OUT // Brilliant comic Mark Thomas reading from his book about his Middle East ramble which took him across “the entire length of the Israeli Separation Barrier crossing between the Israeli and the Palestinian side … six arrests, one stoning, too much hummus”. Vyvienne Long + Our Krypton Son // Thursday 10 May at 8pm // McHughs Basement // £6 // A classically-trained cellist and critically acclaimed songwriter. 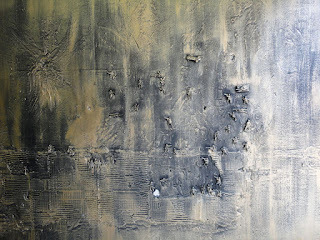 Tracey Moberly: Text Me Up // Friday 11 May at 7.30pm // Free, but book // The Assembly Rooms // Artist Tracey Moberly saved the 90,000 text messages she received since 1999 and has created a “breakneck biography” with them together with a contextual commentary on the amassed missives. A travelogue illustrated with texts and photographs. Kids’ Noisy Cinema: The Red Balloon // Saturday 12 May at 1pm // Belfast Barge // £4 // A percussion workshop followed by a screening of the timeless children’s classic The Red Balloon in which “a young boy discovers a balloon which seems to have a life of its own and together they go on an adventure through Paris”. Suitable for children aged between 7 and 11 years old, it’s a humorous story about friendship and love, without dialogue. Attending children will add their own soundtrack using props and percussion. Hackney Colliery Band // Saturday 12 May at 8pm // The Black Box // £8 // “Bringing the tradition of mobile marching bands firmly into the 21st century” with funk, hip hop, ska and contemporary jazz played by an all-acoustic brass ensemble. Also running throughout CQAF is The Open Source, a performance and workshop space in an otherwise empty Art Deco building in Belfast. Sinclair House – coincidently just opposite the Occupy Belfast People's Bank building – will feature a programme of “art, design, dance, music, gaming, coding, or any other creative pursuit” people are passionate about.